Elizabeth A. Gilbert, age 80, of Edgerton, Ohio, passed away at 4:20 A.M. on Friday, March 22, 2019, at Hospice of Northwest Ohio in Toledo, Ohio, after an extended illness. A 1956 graduate of Edgerton High School, she had been employed by Krill Electric for many years as a bookkeeper and would later be employed by Park View Nursing Center in Edgerton in the dietary department, serving as kitchen manager. 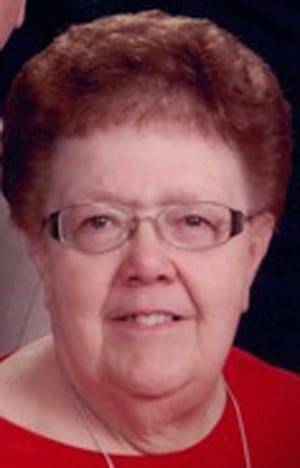 She was an active lifelong member of the Edgerton United Methodist Church, where she was a member of the United Methodist Women, sang in the choir, headed up the dinner committee and was in charge of the card ministry. She was an avid reader and enjoyed playing card games of all kinds. She also was an active member of Phythian Sisters Chapter #449. Elizabeth A. Gilbert was born on August 17, 1938, near Edgerton, Ohio, the daughter of Jacob M. and Jessie M. (Royal) Knecht. She married her husband of fifty-two years, Lee W. Gilbert, on December 15, 1966, in the Emanuel United Methodist church near Edgerton and he survives. Surviving in addition to her husband are one brother, Thomas (Roberta) Knecht, of Edgerton; a nephew, Robert (Denise) Knecht, of Edgerton; a niece, Linda (Dr. Thomas) Ryan, of Westerville, Ohio; and five great-nephews. She was preceded in death by her parents and two infant sons, Lee Martin and David Lee Gilbert. Visitation will be held on Tuesday, March 26, 2019, from 12:00-2:00 P.M. in the Edgerton United Methodist Church. Services will follow at 2:00 P.M. in the church with Reverend Susan Kronbach officiating. Interment will be in Maple Grove Cemetery, Edgerton. Memorials are requested to the Edgerton United Methodist Church. Krill Funeral Service, 114 East Hull Street, Edgerton, has been entrusted with arrangements. Be the first to comment on "Elizabeth Gilbert (1938-2019)"